Data from Recent Construction #91 (Baldwin Locomotive Works, 1918), p. 28-29. See also DeGolyer, Volume 42, pp. 286+. See also "Oil versus Coal Burning Locomotives" , The Commercial and Financial Chronicle - Railway and Industrial Section, Volume LXXXXII (92), No 2392 (29 April 1911), pp. 3-4. See also "Railroad Cooperation", Proceedings of the Western Forestry and Conservation Association, Issue 2 (Seattle, Wash., 2-3 December 1912), pp. 23-.27. (Thanks to Chris Hohl for his 30 May 2016 email noting the original tender capacities and weights.) Works numbers were 38074 in July 1912; 38130-38132, 38167, 38186-38189, 38225-38228 in August; and 38281-38284, 38371-38373, 38382-38384, 38415-38416 in September.. Originally built by Great Northern with relatively tall drivers for a compound articulated. They presented an imposing appearance, showing a high Belpaire boiler over ten axles of running gear. Firebox heating surface included 81 sq ft (7.53 sq m) of combustion chamber All four cylinders were fed through 15" (381 mm) piston valves. The last eight were oil burners and trailed tenders carrying the same amount of water as the first 17, but holding 4,500 US gallons (17,033 litres) of fuel oil. The 1911 C&FC article discussing oil firing noted "Oil has lately taken an aggressive stride forward in its rivalyr with coal as a fuel for engines." The report explained in some detail why the GN was looking toward the liquid fuel: "[M]atters have evidently been hastened in the introduction of oil-burning locomotives by the forest dcvastations of last year. . Minneapolis lumbermen, who have investments in Washington, where the fires were so long beyond control, interested themselves in urging the substitution of oil-burning engines for coal burners. President Louis W. Hill investigated the question from the standpoint of safety to the forests and economy." The results seemed decisive: " On both grounds the inquiry proved satisfactory for the oil burners and the order for conversion was given. No fewer than 115 Great Northern locomotives are being overhauled this spring and changed from coal burners to oil burners. For their requirements a storage plant of 7,000,000 gallons is being erected at Everett, Washington, and the oil will be delivered there by ship from California." The Baldwin specs describe the Emerson "New Type" superheater. The engines were big and superheated and presumably presented some new challenges. So the specs contain some "Hereafter" notes tweaking details. One, however, implied a higher level of urgency. Referring to a letter from F A Neely received on 3 November 1912, the note said "Give particular attention to riveting of cylinder saddles and caulking of same." The N-1s were simpled in the 1920s, becoming N-2s and later N-3s in the process (Locobases 2802 and 6445, respectively). Data from GN - 1 1929 Locomotive Diagrams supplied in May 2005 by Allen Stanley from his extensive Rail Data Exchange. 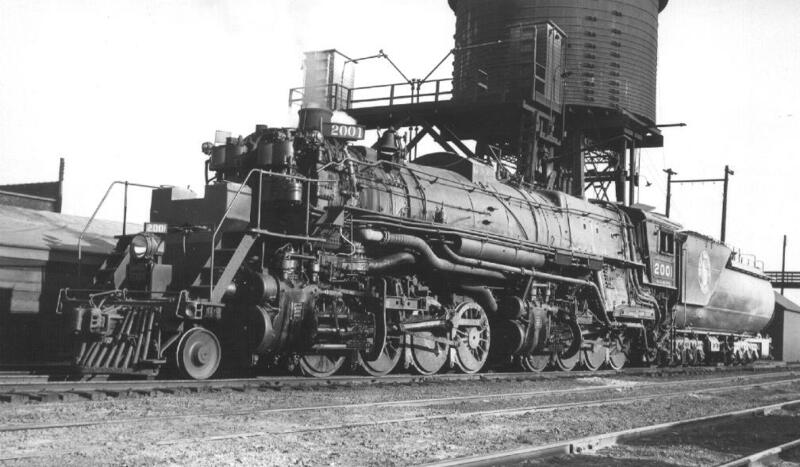 These were the tallest locomotives on the Great Northern because the designers had to get the large firebox above the rearmost driving axle. Delivered as N-1 compounds by Baldwin in 1912 (Locobase 307), these engines were simpled in the mid-1920s, using Worthington feedwater heaters and generating 100,200 lb of tractive effort. The Belpaire firebox with its 81 sq ft (7.53 sq m) in the combustion chamber and 36 sq ft (3.34 sq m) arch remained unchanged. They did get 13" (330 mm) piston valves on all four cylinders. Moreover, the boiler sacrificed 64 small tubes for 18 more flues to accommodate a considerable increase in superheater area. Some were converted to oil burning and trailed tenders carrying 17,000 US gallons (64,345 litres) of water and 4,600 gallons (17,411 litres) of fuel oil. Data from  (visited 7 January 2005). See also GN 4 - 1946 Locomotive Diagrams supplied in May 2005 by Allen Stanley from his extensive Rail Data Exchange. Delivered as N-1 compounds by Baldwin in 1912 (Locobase 307), these engines were simpled in the mid-1920s (N-2; Locobase 2802). S Kip Farrington, Jr, Railroading Coast to Coast (New York: Bonanza Books, 1976), p. 156. Note that they still had the characteristic Belpaire firebox. 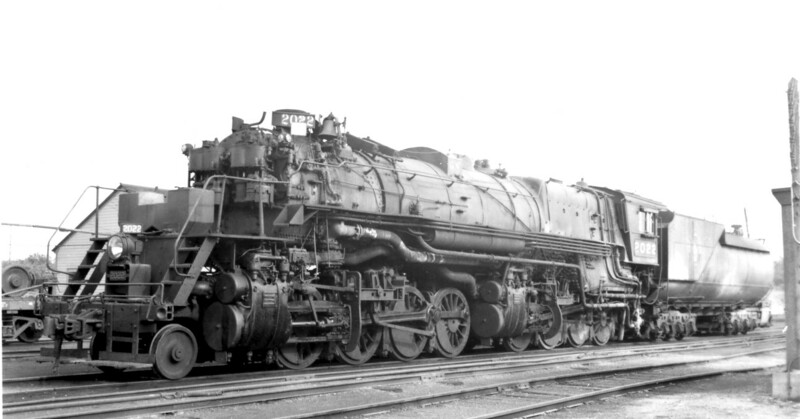 In the early 1940s, the N-2 class (Locobase 2802) got new General Steel Casting Co cast-steel beds, new Baldwin-built nickel-steel boilers, and Timken roller bearings as well as a larger grate; at that point they became N-3s. The firebox was reworked and had a larger combustion chamber contributing 144 sq ft (13.38 sq m) to firebox heating surface area. An additional 33 sq ft (3.07 sq m) came from arch tubes. A comparison with the 1912 compound N-1's factors (Locobase 307) shows what a huge increase in power these rebuilds represented. The railway substituted exhaust steam injectors for the Worthington feed water heaters installed in the 1920s. Elesco supplied the injectors for 2000, 2003-2009, 2016, and 2022. 2012 had one Elesco and one Sellers injector. The other 14 had Sellers injectors. Below the boiler, the railroad installed Timken roller bearings on all driving axles. The timing couldn't have been better, either. The first of the rebuilds (2024) was completed on 10 February 1940, the last (2009) wrapping up almost exactly two years later on 12 February 1942. Thus the greater horsepower was available in time for the Great Northern's World War II traffic spike. And did the N-3s ever deliver, according to Charles R. Wood, in Lines West (New York: Bonanza Books, 1967), p 109, describes them as: "Amazing engines, they hauled ore on the iron range, hustled time freights on the Kalispell Division and served in heavy duty passenger service on troop trains." On the latter service, Wood quotes Mr. J S Miller, Assistant to the Superintendent of Motive Power in 1945/46 as saying that N-3s could "...run like a deer" and hit speeds of 50-60 mph. S Kip Farrington recorded a 17 November 1943 cab ride on Extra 2014 East as it pulled 180 cars weighing a total of 16,740 tons (15,218 tonnes). Virtually all of the class was retired in 1955.